Tower crane manufacturer Linden Comansa used Vertikal Days show in the UK to display for the first time its new cabin, to be launched this summer. 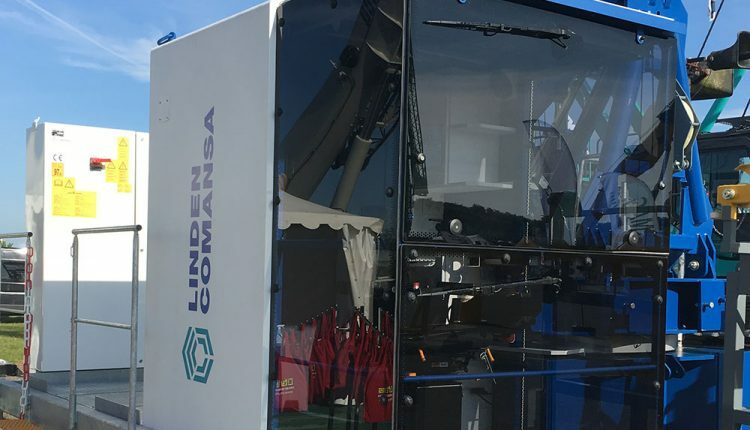 “The squared shape is new and ideal”; “It’s very spacious and bright”; “Uses flat glass, to avoid distortion and be able to easily replace it if necessary”… These were some of the comments heard at the Vertikal Days show regarding Linden Comansa’s new cab, shown to the public for the first time. The presence of this new design at the UK’s most important show for the cranes & lifting business (Silverstone, May 24 and 25) was due a special request by Linden Comansa’s dealer City Lifting. “We already had the chance to see the prototype of the new can at the beginning of the year in Linden Comansa’s premises in Spain, along with other customers and dealers”, says Trevor Jepson, owner of City Lifting. “Our initial reaction was of surprise due to the absence of curved lines, quite common in the cab of most manufacturers. But we loved it right away, even before seeing the inside, which is very bright and spacious. We wanted to show it at Vertikal Days to see the reaction of our customers ourselves, and the truth is that we are very satisfied as they were all delighted with this new cabin”. The large amount of advantages of this new design will be announced soon, when Linden Comansa launches officially the new cab this summer.